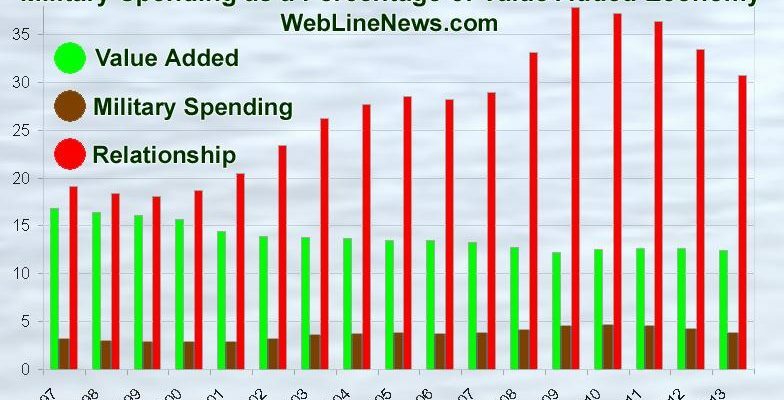 A huge bump and increase in military spending has taken place in recent years, distorting the ratio of military spending compared to value added in the economy. While comparisons of military spending to GDP and comparisons of US military spending to other nations are commonplace, very little consideration has been given to US military spending versus value added in the economy. The huge bump has been mostly ignored until now. US military spending has often been compared to Gross Domestic Product (GDP). Gross Domestic Product is the total value of goods and services produced in the economy in a year. In fact, GDP does not require that anything actually be produced, rather that transactions take place. Much of GDP (about 87.6%) may be described as overhead of production, services or moving money around. Since 1997, the percentage of military spending over GDP has been as low as about 2.9 percent in 1999 and as high as about 4.7 percent in 2010. By 2013, it dropped back to 3.8 percent. This trend is shown on the graph with the reddish bars. Traditionally, an economy was underpinned by the value or wealth added to society. Without value creation, economic improvement was more difficult. 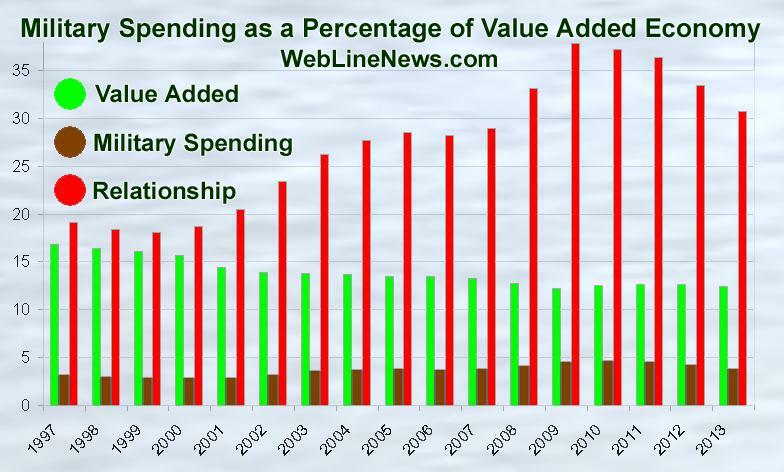 From before 1997 through 2008, value added was on a downward trend. In more recent years, it has steadied out at about 12.4 percent. This trend is shown on the graph by the bluish bars. 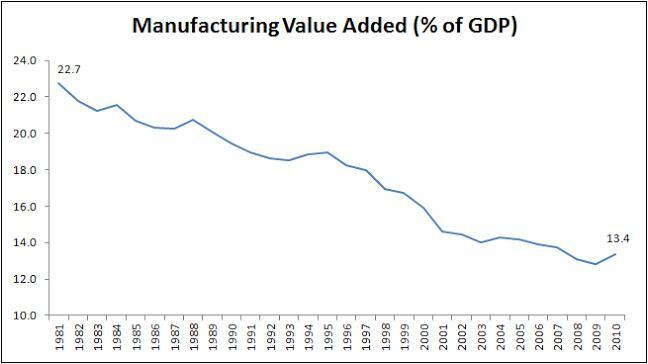 Very clearly, the long-term trend for industry and manufacturing value added as percent of GDP is declining. In my opinion, this problem needs to be addressed in order to ensure healthier economic growth in the foreseeable future. 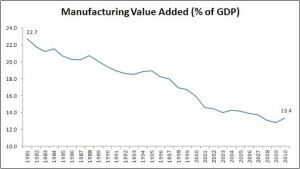 Alternatively, the decline in value added compared to GDP may be partially explained by productivity increases, changing to a service economy, ‘outsourcing’ of manufacturing jobs, and the US trade imbalance. Economists may debate these issues, now informed that much more of the manufacturing economy is tilted toward military value, leaving relatively less for everything else. Comments are open below. From 1997 through 2001, military spending as compared to value added ran at about 20 percent. After 9-11, numbers grew dramatically. The peak in the ratio at about 37.8 percent came in the last budget year of George W. Bush. The ratio has since declined but is still very high compared to historical averages, at about 30.7 percent in 2013. This trend is shown on the graph by the greenish bars.